Students on a visit to the South African Jewish Museum. Photos courtesy of Martin Rosenberg. In the days of apartheid, Marlene Silbert was an activist who used her Cape Town home as a safe house for those on the run from the authorities. 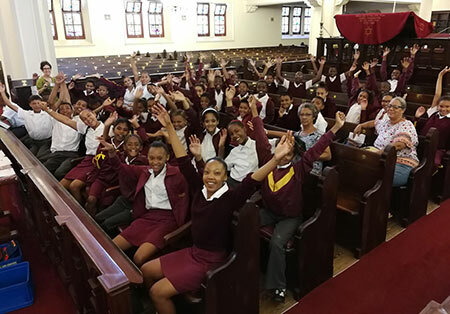 These days, at 83, Silbert has helped launch a successful effort to bring grade school students in the townships—poor black communities along the periphery of the city—to the South African Jewish Museum in Cape Town to learn Jewish history and culture as well as human rights and respect for diversity. ​Silbert, a retired Jewish history teacher at Herzlia High School who also served as deputy principal at the Jewish day school, launched the museum’s outreach program after developing a national high school curriculum for Holocaust education. 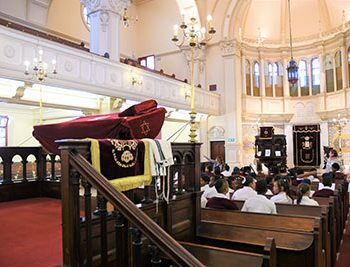 Upwards of 35,000 schoolchildren have visited the museum, located on a campus shared with South Africa’s first synagogue, erected in 1863.